"I've been an artist my whole life," says Mija Andrade, who made national news in 1986 at Salinas High School in California, when she went to the senior prom with her best friend, another girl. "We had boy friends at different schools. When we were denied permission, we took it to court and won the case." Andrade studied graphic arts at UC Santa Cruz and worked for a decade as a graphic artist in Monterey. 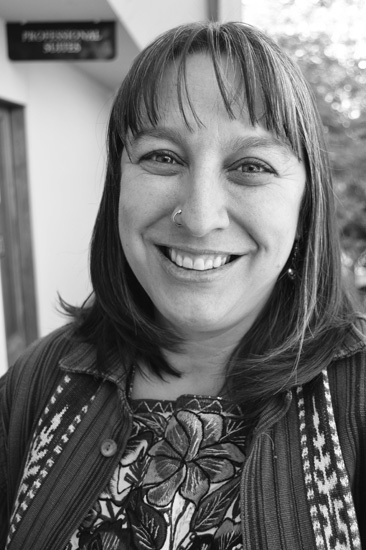 She began to study massage therapy in 1994, a year before moving to Eugene with her then husband. "The licensing process was long," she says, and for 10 years she worked at both graphic arts and massage. "I began volunteering at MECCA in 2006 while recovering from an overuse injury from massage." MECCA (Materials Exchange Center for Community Arts) became her passion. She joined its board, taught classes, and became executive director in 2008. "I started the Object Afterlife Art Challenge," she says, "as a way to challenge artists to incorporate reused materials in art work." The 8th annual Object Afterlife exhibit can be seen at MECCA, 449 Willamette, during the First Friday Art Walk on October 7. She left MECCA in 2013 for a position as resident artist with the Oregon Supported Living Program. "OSLP provides services to developmentally disabled adults," she notes, "but the OSLP Arts and Culture Program is inclusive, open to people of all abilities. Attendance has tripled in three years." Last December, Andrade became development director for OSLP. She is also a 14-year member of the ArtChics women's art group, whose annual benefit art sale is set for November 4-5 at OSLP A&C's Lincoln Gallery, 309 W 4th Ave.